Need Help in Buying Jewelry? Get Tips And Advice Here! 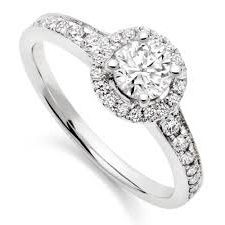 As your big moment approaches it is time to look at the types of engagement rings that are available. How will the ring you choose suit your lovely lady and her lifestyle? How does it define the way that you feel about her? How does it fit in with your budget? Where will you get your ring from? While the simple solitaire diamond engagement ring is the classic expression of love there are many alternatives to this that are easily more impressive, without being too much more expensive. Whether you are designing your own solitaire diamond engagement ring or choosing one from a display case there are a couple of things that you need to know. What Sort of Look Are You After With Your Ring? Do you want a simple solitaire diamond engagement ring? Do you want a solitaire diamond ring that has rows of smaller diamonds each side? Would you prefer a three stone ring, where there are 3 larger diamonds as the centerpiece? Do you want to add some color to your ring by adding gemstones to your setting? A great resource to begin learning more about diamonds is the internet. Wedding forums and diamond centric educational sites like Beyond 4Cs are all great places to start. 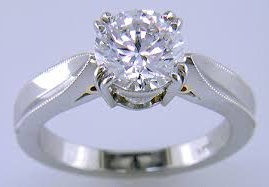 2 – Prong – the traditional way that diamonds are held in place. 3 – Tension – This a modern setting where your diamond is literally squeezed into grooves so that it appears suspended between the sides of the precious metal of your ring. 4 – Pave’ – your ring is literally ‘paved’ with diamonds either side of your center stone. These smaller diamonds are held in place by individual prongs. This allows the most light to pass through your diamonds, creating a spectacular sparkle! 5 – Channel – A channel setting is similar to your Pave’ setting, but the diamonds are secured in a channel that rings through the precious metal of your ring. This holds them secure and helps to protect the precious diamonds from being chipped or snagged on clothing. Because the diamonds are set deep into the band it also means that many flaws in the stones will be hidden, allowing you to use less expensive stones while maintaining the illusion of brilliance. The Jewelry Designer Network is a website dedicated to jewelry businesses. We welcome you to join our network and grow your business.